Salomon Quest Pro 90 model. Used for one week. excellent condition uk size 10 28.0 in ski boot size. Salomon X-Scream 'teneighty' Skis 169cm. Very good condition. Free sticks! Salamon X-Scream Skis 'teneighty' 169cm. Am also chucking in a pair of Rossinol sticks. This ski has an 80mm waist with Salomon's All Terrain Rocker which makes this ski very versatile for a wide range of snow conditions and terrain. This ski has a Titanal and basalt layers to help with stability and dampening when skiing fast so don't be afraid to let go of the brakes on these skis. Brand new, never worn, liner not yet heat moulded. Salomon launch men’s, brown, size 9uk, 10US, 43eur. Bought these for this season but found a pair of old stock Nikes that fit me better so decided to sell these. No box, 2018 model. Grab a bargain. 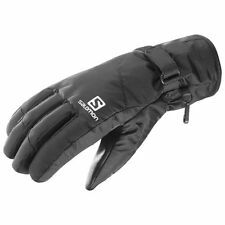 Salomon Snow Blades (2 Pairs & Bag). Condition is used but still overall in good state, with one chip on rear of one of the blades. Salomon Rhythm Snowboard Bindings, S orange. Condition is good, used. Please ty of life left in these. Only for sale as new board came in bundle with new bindings. 1 of the screws has been replaced with a black one. Salomon Faction Boa snowboard boots in UK10. These have never been boarded in but do have a nick on both heels where the outer shell has chipped away exposing some of the inner. These are not deep and won’t affect performance but are noticeable (please see photos). 171 Salomon Teneighty Skis with Salomon S 810 TI Bindings, Scott Poles and Salomon Ski Bag. All are sold as used. Din settings range from 3 -10. TheSalomonTeneighty skis represented a leap forward in design andengineering, allowing contemporary skiers to push freestyle skiing into themainstream. Virtually brand new as only worn for 4 days on a Superskills Travel Ski Weekend. JACKET Features: CLIMAPRO 10000/10000 technology fabric Adjustable cuffs Internal zip pocket Internal goggle pocket Wrist lift pass zip pocket Snow skirt Adjustable toggle hem Detachable Toggle hood JACKET LINER IN TURQUOISE Attaches with popper fastening to back neck and cuffs of the Black outer jacket CLIMAPRO 10000/10000 technology fabric Fabulously warm jacket and liner from a top brand. Pls check out my other items too! Salomon Ski Boot Bag. Condition is Used. Dispatched with Royal Mail 2nd Class. Saloman ski boots size 10. Condition is Used. Pair of Salomon snow blades ideally for freestyle skiing or jumps / tricks practice. Easy adjustable bindings. Only used a handful of times. Come with carry bag. 1080 SALOMON TENEIGHTY Space Frame 171 Freeride Tweentip Skis. Condition is used, but very good considering age. Loads of edge and no damage to base. Light cosmetic scratches on upper surfaces. Bindings are matching Salomon S912TI, again in very good condition. Serviced after use this season and ready for the slopes next winter. Happy Bidding. Bonfire Waterproof/Breathable trousers, size large, zipped side vents, 5 pockets including pass holder. Small tears caused by ski edges at the bottom/boot area, but does not affect performance. Originally bought from Snow and Rock. Salomon ski sleeve bag. Excellent condition. 185cm size. Dispatched with Royal Mail 2nd Class. Salomon Seek Unisex Snowboard/Ski Helmet ect, Metallic Black and Silver Size XL. Only Used a few times. Removable lining for washing, Condition is Used. Dispatched with Royal Mail 2nd Class. salomon ski jacket. Condition is used but had never been worn before. I found the jacket too might for my generous girth! Designed more as a jacket to wear inside your main ski jacket, for be wear it as a casual jacket. Olive green and khaki this is a mid to large size bag between 55lt and 75lt in capacity and made from 550d cordura. Boot compartments and both ends, U-shaped lid for maximum opening, shoulder strap, great for skiing/snowboarding trips and distinctive colourway without being in your face. You know Salomon quality........ Free postage in UK so what you bid is what you pay! Salomon ski boots 27.5. Condition is Used. Dispatched with Royal Mail 2nd Class. Condition is Used. However only used twice so pretty much new. Ski mask (£40). Ski boots(£100). Suitable for all levels from beginner to advanced. I'm including the Salomon ski bag and a pair of poles in with the price. used solomn boots served me well maked as expected used for 2 seasons. You are bidding on a pair of men's Salomon Dialogue Snowboard Boots, size UK8.5 or EU42⅔. They are in fair condition having been used for a couple of seasons. All tightening laces work well. The left toe has some damage as shown in the picture. Supplied without box. Local collection available from Stirling, Glasgow or Edinburgh. Feel free to ask any questions and check out my other auctions. Skis. Men’s Salomon Scrambler Hot Skis. Size 174. Skis. Men’s Salomon Scrambler Hot Skis. Size 174.Condition is Used. Sidecut is 113/77/106 turn radius is 17.5. Old ski but looked after and reviews are excellent. https://www.ski-review.com/ski_reviews/review/salomon_scrambler_hot_2006/ Any queries just message me. SALOMON SNOWBLADES MINIMAX SHORT SKIS BLADES BINDINGS BAG . Condition is Used. Dispatched with eBay delivery – Shutl 2-3 days. Salomon Crossmax 10 ski Boots Size 28.5 UK 10. Used for 2 weeks only so in very good condition. Complete with a Trespass Boot Bag. SALOMON X MAX 100 MENS SKI BOOTS 28/28.5. USED ONCE. UN-MOULDED. LIKE NEW. USED ONCE, UN-MOLDED. Haven’t had them moulded so they’re ready to be heat moulded to your feet. USED ONCE. Condition is Used. 60% heat moldable inner boot, around the ankles and the shins. PU/PA Shell. Lacroix Espace carbon/kevlar 175 skis with Salomon S700 bindings. These are a high quality traditional design but still perfectly useable, as I did two weeks ago. I am selling as I am giving up skiing. Collection please from near Burford or my office in Hungerford. I may be able to deliver along the HS2 route from Bucks to Warwickshire. Please see my other items as I have 28.5 boots to fit these, and poles. Salomon Womens Ski Snowboard Jacket Small Lime Green with grey internal lining. Condition is Used but very good. Detachable hood. Snow skirt and internal goggle and phone pockets. Underarm vents. Three external pockets and ski pass pocket in left arm. Adjustable Velcro wrists. Dispatched with Royal Mail 2nd Class. Salomon Junior Q-Max carver ski. Great condition. Salomon Enduro Performance Winter Sports Socks - 2 pairs for just £12 !! !